On my most recent trip to Yosemite, I camped again at Tuolumne Meadows. 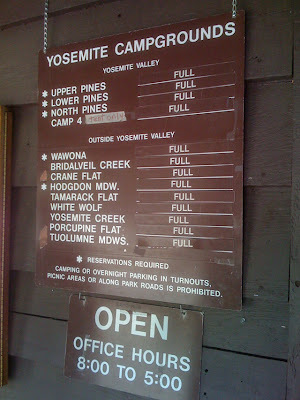 All the campgrounds were full, and I put my name on the waiting list. This is the second time that's happened, and the second time I've been rewarded with a camp site. Again I was amazed at how many people don't return for a site. This time, over half the names called weren't there. 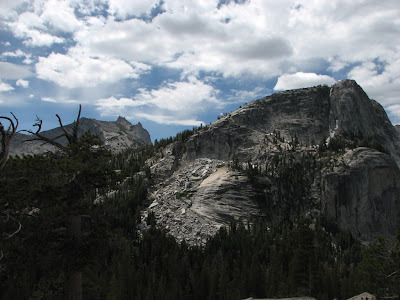 I'd planned to try hiking to the summit of Mariolumne Dome. 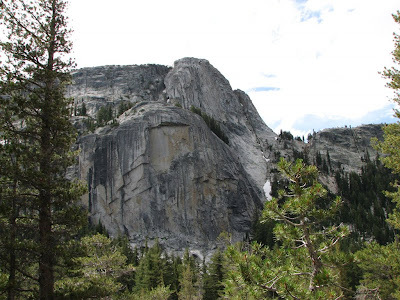 It's the tallest in the TM area with a summit elevation of 9,970 feet. Unfortunately, I'm out of shape and I was too winded before I even made it to the end of the climbers trail. So instead I hiked on the small dome to the north, which gave me some great views of Mariolumne and the other domes in the area. That's Mariolumne on the right, and Cathedral Peak just left of center. I kept hearing climbers hollering at each other, and it took me a while to spot them. You can barealy see one here in this shot - the white dot in the middle of the verticle slab. This climber is actually on Drug Dome, climbing the route named OZ. That's the one in front with the scary overhand. The climbing routes go right around that overhand. Check out the route image on SuperTopo. It's only a 5.10d. Wow. Climbing on that would totally freak me out. 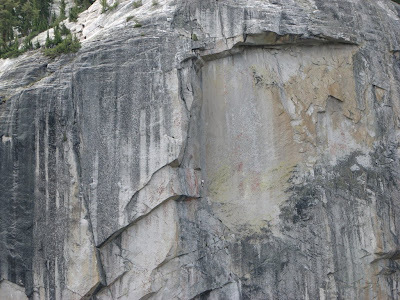 They've got some interesting posts from people who've climbed it. One did it with his 13yo daughter. I'll return some day and get up to the top of Mariolumne.